I hope you have been having fun celebrating the past holidays with family and friends. I was thrilled to have my son, Karl come home from Minnesota for a week. Others were here as well, and I enjoyed every minute. Now begins the cleanup, laundry and pack away decorations time. The best part is (after a week off) I can start quilting again! I miss my sewing machine. I want to share a few photos with you of Quilt gifts I made this past month. My son celebrated his 39th birthday while he was here so I made him a new “Pumpkin Patch” quilt. 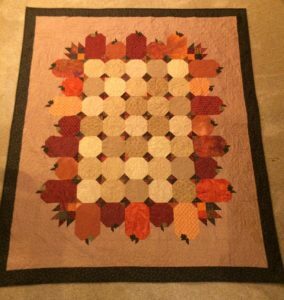 He loves to grow Giant pumpkins (close to 500 pounds) so I thought he might appreciate a quilt with lots of them. It can keep him warm on those below zero nights in Minnesota. 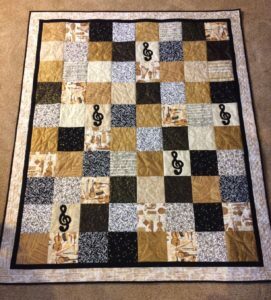 This is a Kansas Troubles Quilters pattern and went together quickly. Obviously, he is enjoying it while watching a little TV. The musical quilt I made was for my brother-in-law to celebrate his 80th birthday last week. He loves classical music and his professional career was as a High School band director. He still plays clarinet in the Denver Concert Band. I thought musical fabric and objects would work great for him. 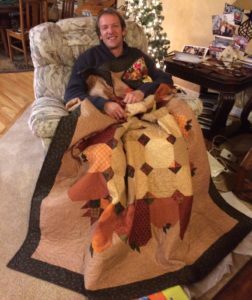 The quilt is made up of 80 blocks for his 80 years and it finished at 55” x 87” so he can use it to cover up during nap time or watch TV. Now I am ready to get back to making more doll quilts – you know you can never have enough. Tonight is New Years Eve. I hope your resolution list includes making even more quilts this year than you finished last year. Maybe it will also include finishing some of those that have been set aside but never quite got done. Either way – Happy New Year to you! ← Letter Z Sale News!